AmazonSmile is a simple and automatic way for you to support the Robla Education Foundation every time you shop, at no cost to you. When you shop at smile.amazon.com, you’ll find the exact same low prices, vast selection and convenient shopping experience as Amazon.com, with the added bonus that Amazon will donate a portion of the purchase price to the Robla Education Foundation. Unfortuantely, we haven’t been as successful as we would have hoped at getting the word out. Below is a communication we recieved from Amazon letting us know that we need more of you to support us as you make purchases from them. We have just completed AmazonSmile donation disbursements for the 2014 Q3 disbursement cycle to organizations that generated the $5 minimum disbursement amount or more. Robla Education Foundation will not be receiving a donation this quarter from the AmazonSmile Foundation because your donation balance was less than the $5 minimum disbursement amount. Don’t worry – we will hold your donation and add it to a disbursement in a future quarter. For more details, visit http://org.amazon.com and click on the Receive Donations tab. In the meantime, you can increase your organization’s donation potential by spreading the word about AmazonSmile. Sign in to http://org.amazon.com and click on Marketing Tools to access customized online tools to let your supporters know that their AmazonSmile shopping can support Robla Education Foundation. Here are several tactics that have been successful for participating organizations. 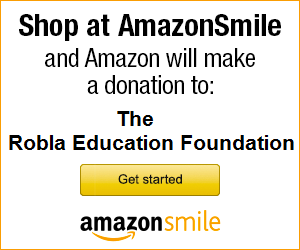 Share this link: http://smile.amazon.com/ch/94-3323085 and ask your donors, volunteers, employees, and friends to bookmark this link so all their eligible shopping will benefit Robla Education Foundation. Copy and paste this message in a Facebook post: When you shop at AmazonSmile, Amazon donates 0.5% of the purchase price to Robla Education Foundation. Bookmark the link http://smile.amazon.com/ch/94-3323085 and support us every time you shop. You can do a lot to help the children of Robla without it costing you one additional cent! Just make sure that when you shop at Amazon.com please do it through http://smile.amazon.com/ch/94-3323085.